WRAP, the Western Regional Advocacy Project, held a protest of the Obama administration's lack of action on housing and homelessness. Activists from the west coast including San Francisco, Oakland, LA, Sacramento, Fresno, and Portland began with a rally at Justin Herman Plaza. They then marched down Market St. As they passed banks, they chanted, "Banks got bailed out, we got sold out!" As they passed the San Francisco Shopping Centre, they chanted, "Not another shopping mall, housing for all!" Part of the time, they marched in heavy wind and rain. The march was originally going to end at the San Francisco Federal Building, but a permit was pulled. They held a spontaneous rally while a delegation met with Speaker Nancy Pelosi's San Francisco office. The march ended in front of San Francisco City Hall as preparations were underway for that evening's San Francisco Ballet Gala. 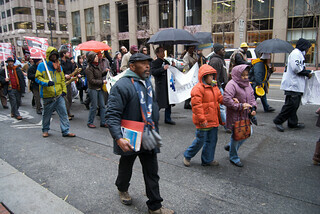 The Brass Liberation Orchestra played throughout the march.